You gingerly lift a new arrival off the shelf and flip it open, trailing your finger across the printed page. You imagine yourself sipping an espresso as you thumb through the pages, savoring every plot point and befriending new characters. …and then someone hands you a worksheet. Did the bookstore fantasy crash down around you? Yeah, I thought so. If we really want to help students love reading, we need to stop crushing them with comprehension worksheets. There’s a time and a place for those, sure, but we can think of more innovative ways to ignite a love of reading. (Note: This post does not contain affiliate links. I trust these bloggers and collaborate with them regularly. Teaching short stories can be a great way to build student confidence and endurance with a number of skills. ‘Short stories’ is a mode that spans across all genres and has wide boundaries for what works with a given text. Because short stories are so versatile, teachers can teach them as a unit OR work them in throughout the year. Here are some of my favorite resources and ideas for teaching short stories. Choosing what stories to teach can be daunting, but it can make a big difference to your students! Ideally, you want a wide variety of engaging stories, and you’d like them to have clear (and subtle!) examples of key concepts you’ll teach. 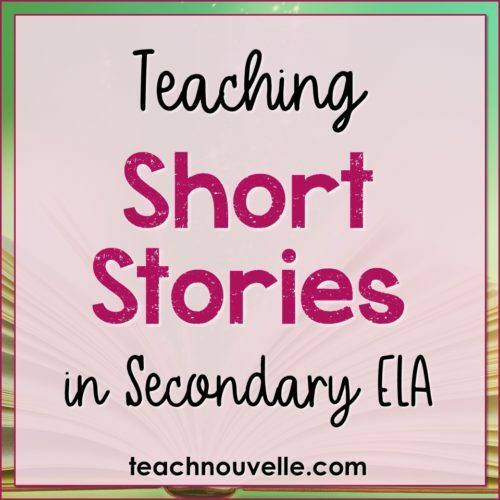 This list of 15 Short Stories for Secondary Students is a great place to start. Several teachers have submitted their favorite short stories to teach, and briefly summarized their favorite activities to accompany them. A definite win! For the final test in my Short Stories Unit, I want students to have the opportunity to apply a range of analysis skills to one new (very) short story. That’s why this list of Very Short Stories for High School is so valuable to me. One of my favorites for this type of test is “The Story of an Hour” by Kate Chopin. If you want to get more specific, Bright Hub Education has some great lists for Stories to Teach Symbolism, Stories to Teach Conflict, and Stories to Teach Character. During my Short Stories Unit, I also mix in some short films and songs to use as mentor texts. Check out my list of favorite songs for ELA here. I like to mix up the reading activities we do with each text, as opposed to handing out the same worksheet every time. Here are some activities I LOVE that can be adapted for a range of stories. Before students read, you can set up anticipation games and activities. I like to rewrite texts into Inference Challenges for my students. For example, I took “The Black Cat” by Edgar Allan Poe and rewrote it into four texts from the perspective of a young police officer who has to keep coming to investigate these reported disturbances. Students slowly figure out what’s going on, and then they read the story to see how close their inferences were. The best part about this is that, since they’re already familiar with the plot, they can focus on the vocabulary and syntax. Put students into groups, and give them the exposition and one plot point of the story. Allow them to act out a middle and an end. This is a lot of fun because you’ll have groups end up with something close, and others who end up very far off! Either way, it’s not about being “right”, but imagining possible outcomes for any given setting and characters. You can have students create their own Reader’s Theatre versions of a short story and perform them for their classmates. 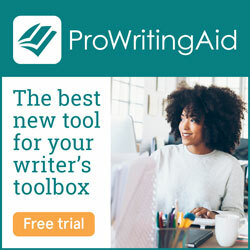 You could have groups choose from 4-5 pre-selected stories, read them, and write their versions. For a lower key activity, allow them to improvise. Lauralee from The Language Arts Classroom also has some great ideas for Pre-Reading Activities for Older Students. My favorite is to “zoom in” on a fact that comes up in the story. For example, before reading “An Occurrence At Owl Creek Bridge”, students may need some background on the Civil War. You can also set up a series of stories with a technique or genre in common. Students could read all of them, or work on one of them in a group and present to the class. I love using these Literature Circles for demonstrating the range of Unreliable Narrators in fiction. 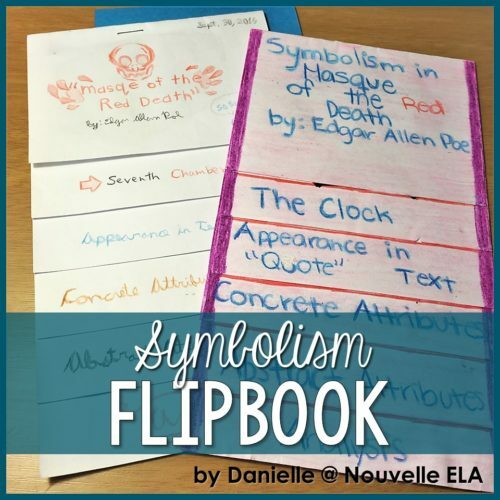 After reading “Masque of the Red Death”, my students make Symbolism Flipbooks using one of the symbols from the story. This is a great analytical and creative activity that provides students with a deep dive into analyzing a symbol. 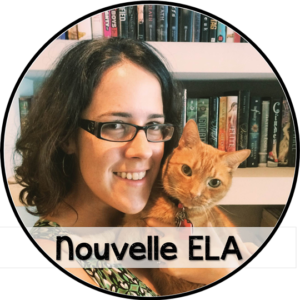 For even more ideas about engaging reading activities, you can check out this post from Secondary Sara about Upgrading Your Short Story Unit. I also love this list of 10 Fun Post Reading Activities. I also use short stories as a low-stress way to work in some creative writing. After we read “Lamb to the Slaughter”, my students take on the role of lawyers at Mrs. Maloney’s murder trial. We all agree that she’s guilty, but students write closing arguments as either her defense or prosecution. Another popular option is to have students write short stories as flash fiction as they learn more about plot structure and literary devices. You can read more about that concept here. Lastly, you can have students do a full on Writer’s Workshop and craft their own short stories. We did that last year while studying the dystopian genre, and I talk about those experiences in this blog post. Student results were incredible, and I definitely want to open them up to any genre this year. You’re ready to innovate & engage! Which idea for teaching short stories are you ready to use this year? I’d love to hear from you in comments, or on IG or FB @nouvelle_ela. You can also check out my entire Short Stories Unit on TeachersPayTeachers. 🙂 Thanks for reading, and keep in touch!